What Is the Most Abundant Organic Compound on Earth? The atmosphere is essentially the air that envelops the Earth's surface. Measured in volume, the dry air of the atmosphere contains 78.08 percent nitrogen, 20.95 percent oxygen, 0.93 percent argon and 0.038 percent carbon dioxide. 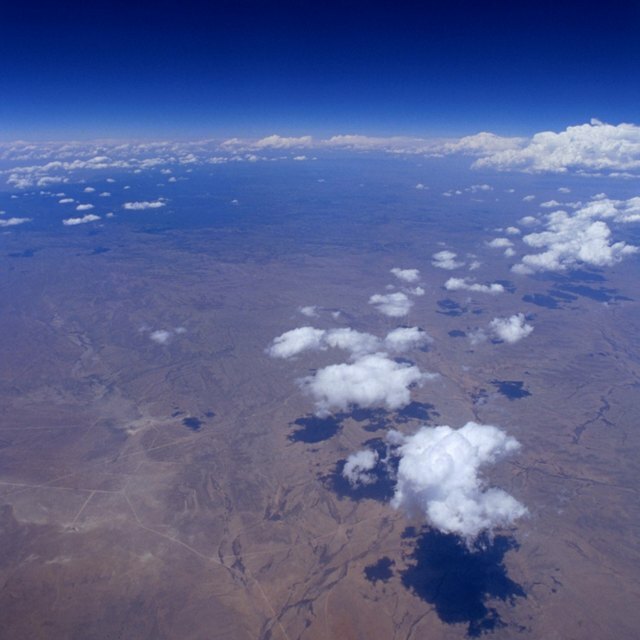 Although no concrete boundary defines the atmosphere, it does not exert any visible effects on climate after about 75 miles above Earth's surface. Of all the five components of climate, the atmosphere is the most dynamic and changeable. For instance, the heating and cooling of air creates wind currents that carry water vapor and move heat from one part of the Earth to another. The fresh and salt waters of the earth, including lakes, rivers, subterranean waters and oceans, make up the hydrosphere. The ocean accounts for about 70 percent of the planet's surface. The waters of the hydrosphere store and transport energy, break down minerals, store carbon dioxide and, especially in the case of oceans, retain a massive amount of heat. As this heat helps prevent drastic temperature changes, oceans serve as the planet's climate regulators. The cryosphere is the ice on the earth's surface. This includes ice sheets, glaciers, permafrost, sea ice and snow cover. In addition to storing great amounts of water, the ice of the cryosphere reflects solar radiation back into space. Perhaps most importantly, the cryosphere contributes to deep ocean water circulation. As large ice volumes accumulate and melt, the process causes variations in sea level. The lithosphere is the Earth's solid land. As the outermost shell of the planet, the lithosphere includes soils, plains, mountains and anything geologically connected to them. In comparison to the other four components, the lithosphere exerts relatively little influence on climate, although the composition of land and soil affects how radiation from the sun is either absorbed or reflected back into the atmosphere. Additionally, the texture of the lithosphere affects the impact of wind as it travels over the earth's surface. The surface texture of the earth, for instance, creates rain shadow deserts. All of the living plants and animals on earth compose the biosphere, including marine and terrestrial organisms. Living creatures exert a huge influence on the uptake and release of greenhouse gases. The Earth's plants store significant amounts of carbon dioxide, making them key players in the carbon cycle. The biosphere also affects the planet's climate through surface albedo, or the reflection of light. The large-scale texture of plant growth in the biosphere influences the process of water transfer from land to the atmosphere, just as it influences the travel of wind. Large forests contribute to the creation of their own local climates. Ketchum, Dan. "Five Parts of the Climate System." Sciencing, https://sciencing.com/five-parts-climate-system-21166.html. Accessed 23 April 2019.